An account by whistleblowing doctors, with an introduction by GroundUp. 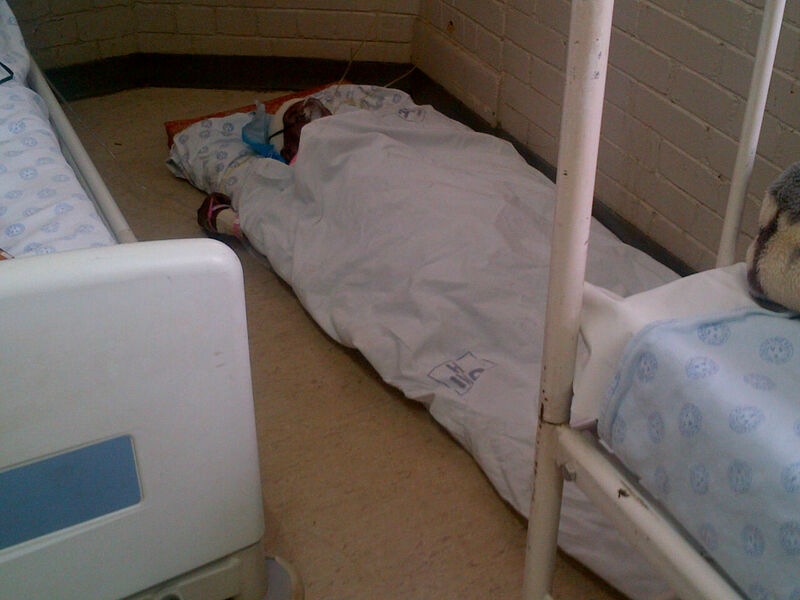 A patient, after being operated on, lies on the floor in a Free State health facility. Doctors working in the Free State public health system have written a devastating indictment of MEC for Health Benny Malakoane as well as Premier Ace Magashule. They describe how through a combination of ineptitude, corruption and neglect the Free State Health system has been brought close to collapse. We are not in a position to verify many of the claims made by these whistleblowers. We have decided to publish their account because the allegations they make are for the most part within their direct experience. Furthermore, the doctors allege that patients are dying because of the way the health department is being run. It is therefore of considerable public interest to publish this. GroundUp sent a list of questions to MEC Malakoane and Premier Magashule at 11:50am on 26 February. We made several attempts to contact their offices. The MEC's office committed to providing answers by 10am on 27 February. After deadline, spokesperson Mondli Mvambi sent an email stating, "I am unfortunately diverted into attending the business of the Legislature this morning and will thus not be able to assist on time as was discussed yesterday. I can only do so at the end of the session of the sitting." The premier's spokesperson did not answer his phone and no response at all was received from the premier's office. The challenge by the doctors to the media is that we investigate their claims. They have chosen to publish anonymously because they fear for their personal safety and their jobs. Below is an edited and shortened version of the whistleblowers' account. We are medical doctors working in government hospitals in the Free State who believe it is our duty to inform the public of the dire conditions in the Free State Department of Health. What we report and allege here should be investigated and reported. In particular we appeal to the SA Human Rights Commission to take our allegations seriously because what we report is a violation of rights to health, dignity and equality. Not many years ago the hospitals in the Free State were among the best in the country, known not only for the world class medical care that they provided, but also as excellent training institutions for medical students, interns and registrars (specialists in training). Doctors used to queue for employment in these hospitals. 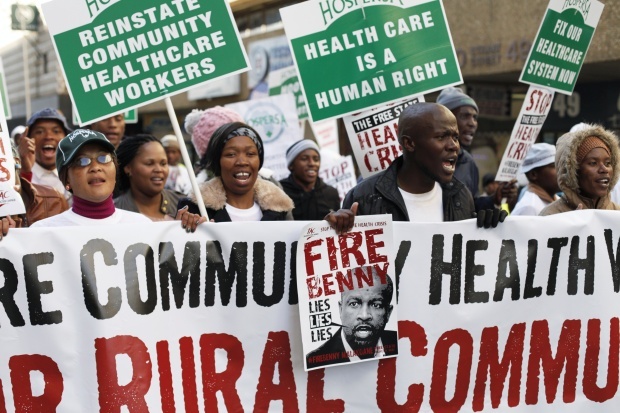 The decline of the Free State health system has accelerated since Ace Magashule became premier, and even more so with the appointment of Benny Malakoane as MEC for Health. Many hospital buildings are in a state of disrepair. Renovations, if embarked upon, are often halted midway without any explanation offered. The work that has been done is usually amateurish and substandard. Broken windows are not repaired, but rather covered with plastic or cardboard. Elevators regularly break down, necessitating hospital staff to carry patients up and down stairs on stretchers. If this is not possible, as in the case with ventilated Intensive Care Unit patients for instance, these patients simply cannot be operated on, and unnecessary deaths occur. Corpses had to be carried down the stairs, in full view of horrified patients and visitors. 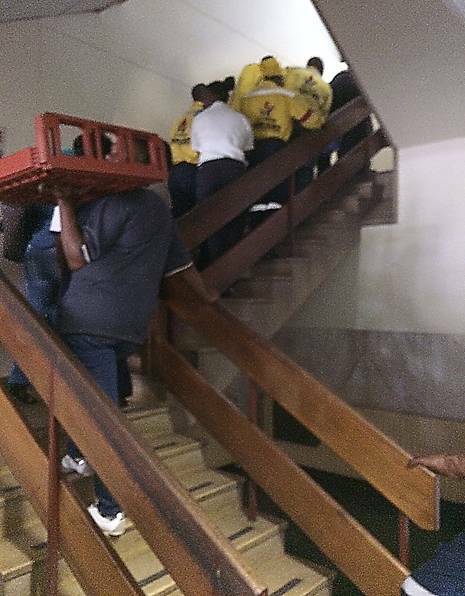 Recently the Fire Department had to help out in Dihlabeng Hospital to carry patients up and down the stairs. Not once during this crisis was the hospital visited by people in the health department's top management. Elevators break down regularly at Free State hospitals. These hospitals stand in stark contrast to the posh offices in Bophelo House, Head Office of the Free State Department of Health. There is a constant shortage of even the most basic medications and consumables. Excuses vary from unavailability of stock from the suppliers to ineptitude in the medical depot. Often the suppliers do not deliver stock because they are not being paid by government. But, whatever the reason, the hospitals end up without necessary, often life-saving, supplies. No one appears to take responsibility and no one is held accountable. Doctors sometimes have no option but to look to private hospitals for second-hand instruments (which are either certified for single-use only, or past their ‘sell-by’ date) to do surgical procedures. Patients and their families often have to buy consumables like wound dressings and basic medications, which should be available in any hospital. A point in case is antibiotics: the most basic and inexpensive are often unavailable. Further examples are intravenous nutrients and dialysis, which can be life-saving in critically ill patients. ECG paper is often out of stock. Myocardial infarctions (heart attacks) as well as other heart conditions, can therefore not accurately be diagnosed, and obviously not treated. Cardiotocography paper, used in pregnant patients to monitor the foetus, is sometimes not available, and foetal distress can therefore not be diagnosed and adequately treated. This may lead to foetal deaths or brain-damaged babies. Even printing paper or ink is sometimes unavailable, rendering the printing of legal documents impossible. Patients do not have proper bedding and sometimes have to do without pillows. The full list however is endless. The net effect of this is that medical staff are forced to make the best use of the medication and consumables available, which is often inappropriate and against their better judgement and ethical values. How do we explain this to the patients? Equipment is often old, outdated, seldom serviced and almost never replaced when broken. Once again, these often have to be borrowed from private hospitals, or be done without. In Dihlabeng Hospital alone about 300 patients are on a waiting list for spectacles, but cannot get it due to lack of funds. Patients sleeping on top of each other in a Free State hospital. Doctors who have undergone training and served the required time in government for a promotion or grade increase do not get paid accordingly due to lack of funds, even though they perform their duties and take responsibility. Medical officers do not get grade increases to which they are entitled according to the Occupational Specific Dispensation policy from 2009. This is unlawful and the Free State is the only province where this is happening. MEC Malakoane admitted that 70% of ambulance personnel are inadequately trained. These are the people that are supposed to give medical care in emergency cases. Most of the ambulance services have been outsourced to a private company, Buthelezi Ambulance Services. According to Malakoane this is to improve ambulance services. This is while provincial ambulances stand unused, with frustrated ambulance personnel sitting idle. The X-ray services in the Free State regional hospitals are capped to ten hours overtime. In many hospitals no X-ray service is available after 8pm. However, brand new Panorex X-ray machines, which are exclusively used in dentistry, have been delivered to every hospital, whether they offer a dental service or not. Spoof newspaper published by the Treatment Action Campaign (TAC) as part of the organisation's "Fire Benny" mobilisation. 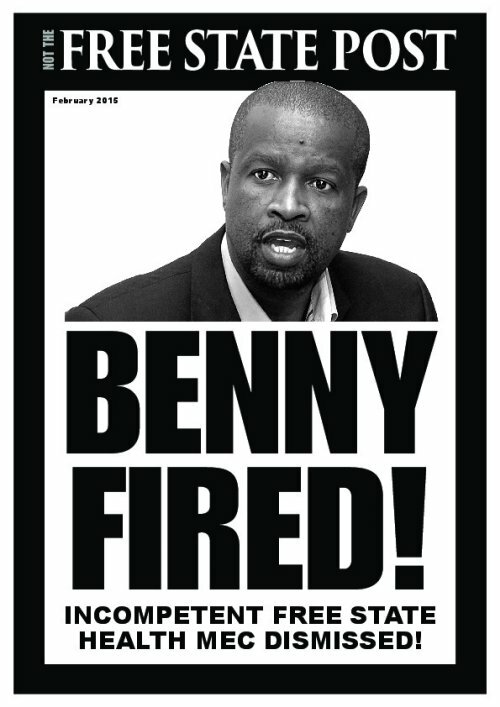 ANC Youth League pamphlet in response to the TAC's "Fire Benny" mobilisation. Pelonomi Regional Hospital was once a highly efficient fully fledged hospital, but now it struggles to deliver medical care if and when it can. Medical students are often forced to buy their own consumables like syringes, needles and swabs due to lack of hospital stock. Patients lie for weeks and even months awaiting surgery due to lack of equipment or specialists. The Department of Orthopaedics has no surgeons to perform spinal surgery as their contracts for sessional work have not been renewed. There is only one orthopaedic drill in the entire hospital, and it is not fully functional. This hospital has crashed to such depths that it was even suggested at one stage that private companies or individuals "adopt" a ward by funding it in order to keep things afloat. The standards in Bongani Regional Hospital in Welkom have dropped so low that it is at risk of losing its accreditation to employ and train interns should it not adhere to an ultimatum from the Health Professions Council of South Africa (HPCSA) to meet minimum standards. This means that if these criteria are not met, the interns will be removed from this hospital, further compounding the staff shortages. More hospitals imminently face the same problem. Upon various unsuccessful attempts to meet with MEC Malakoane, a comprehensive list of concerns was sent in January 2014 by one regional hospital's consultants to National Minister of Health Dr Aaron Motsoaledi and to Malakoane. Nearly two months later they have not received any reply, not even a recognition of acceptance. And in the meantime conditions deteriorate on a daily basis. A beautiful hospital was built in Trompsburg next to the N1. It is still not open due to lack of equipment. Dr Sehularo Gaelesjwe was appointed as CEO of Universitas Hospital, the main tertiary care hospital in the Free State as well as training facility for medical students and specialists. This followed a controversial stint at a Gauteng Hospital. At Universitas he embarked on a firing spree. Staff who differed from him or had the slightest whiff of misconduct hanging over their heads were suspended. Professor Theron, Head of the Department of Cardiology, after an argument with a car guard, was charged with racism and assault, and immediately suspended. He was subsequently found not guilty on the charge of racism, but guilty on the charge of assault for tossing a washing cloth weighing a couple of grams at the car guard. Subsequent to this Professor Theron did what any reasonable victim of a witch hunt would do: he resigned. Following this, the only remaining consultant in cardiology did what any reasonable only remaining consultant in a department of such a magnitude would do. He also resigned. Concerned about the imminent collapse of this department, a group of private cardiologists offered to help with consultations and after-hour calls. They were appointed on a part-time basis, but resigned after a few weeks when the health department did not pay them as agreed. With no cardiology consultants left, the cardiology department had to close. No tertiary level cardiologist was available in the entire Free State, and medical students as well as registrars had no one to train them, and regional hospitals had nowhere to refer patients. Many patients that could have received adequate treatment died during this time. After rushed new appointments, the once proud cardiology department is severely crippled. This has had a domino effect, impacting on various other departments such as cardiac surgery, internal medicine and anaesthesiology. Gaelesjwe, for no clear reason or explanation, then suspended, among others, a senior (and about the only) paediatric orthopaedic surgeon, resulting in the paediatric orthopaedic services in the Free State grinding to a halt for months. This was followed by the suspension of the head of trauma surgery, also a gifted doctor, passionate about his work. These doctors were subsequently reinstated in their posts, without any explanation. The Head of Trauma has recently resigned and is relocating to the Western Cape. Professor Vernon Louw, Head of the Department of Internal Medicine and an outstanding academic, received a final written warning from Gaelesjwe for drawing up a call list in Afrikaans and English, and not in English only. Due to the malfunctioning cardiology department the hospital had to outsource cardiology procedures to private hospitals, paid for by Universitas Hospital, after being approved by the CEO. Louw had such a patient who required a coronary stent. Gaelesjwe refused to approve the transfer to a private hospital and the patient died. Not prepared to work under such ineptitude and without the vital support from departments like cardiology and nephrology, Louw resigned and also went to the Western Cape. The MEC took action only after about 20 specialists had resigned, including nearly all the specialists in the nephrology department, with a significant number of remaining specialists in Universitas Hospital threatening a mass resignation should Gaelesjwe remain CEO. Gaelesjwe was quietly removed, pending an investigation to establish his ‘fitness’ to perform duties as a CEO. Today Universitas Hospital, until fairly recently the flagship of medical care and training in the Free State and one of the best in South Africa, has been dealt a significant, possibly irreparable, blow. A large number of specialists and professors have left, taking along with them years of experience and expertise in medicine, teaching and training. It is now staggering along. The Faculty of Medicine of the UFS currently operates without several heads of departments, which hampers leadership, training and research. Academics are not applying to fill the posts. Many departments have vacant posts for registrars, and are willing to take any applicant, whereas in the Western Cape there are long waiting lists, with only the best candidates being successful. This sad situation is very unlikely to change in the future and will most probably deteriorate further. Protest calling for health workers to be reinstated and the MEC of Health to be dismissed. Photo courtesy of the TAC. The Free State Department of Health is R800 million in the red. The Department owes R600 million in malpractice suits, which Premier Magashule blames on doctors. But there are many examples of wastage. Once a month a gastroenterologist is flown from Bloemfontein, by the emergency medical helicopter, to a regional hospital, where he spends about one hour, giving a short lecture and performing at the most two scopes, which are usually done by the general surgeon in any case, but in far larger numbers and far more efficiently. The same is done with a child psychologist. The provincial health department created a Chief Operating Officer (COO) post. According to the department's spokesperson, Mondli Mvambi, this was done to add further to the expertise of management, which already consisted of an MEC, a Head of Department and a Deputy-Director General. Dr Balekile Edward Mzangwa, mayor of Maluti-a-Phofung and Thabo Mofutsanyane over the past 14 years, lacking recent experience in medicine, was appointed into this position. His COO position duplicates the work of the HOD. He also earns the same substantial salary as the HOD. 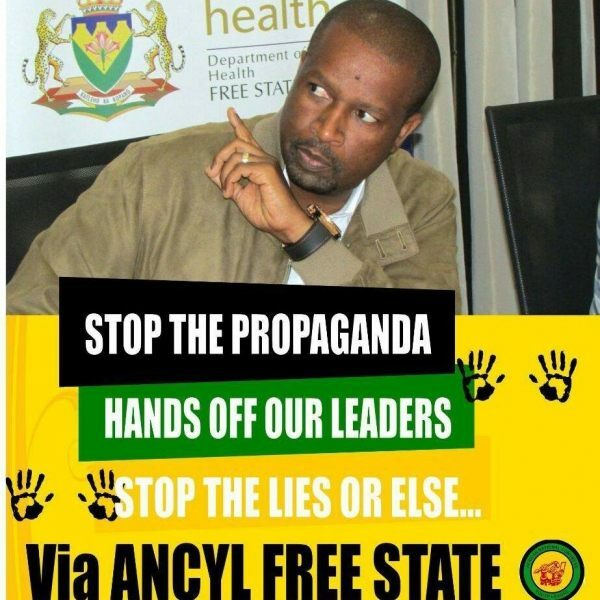 He has been put in charge of regional hospitals in the Free State. The dire situation at Dihlabeng Hospital, such as the critical lack of doctors and equipment as well as the broken elevators, was communicated to Mzwanga on various occasions. After receiving no feedback, plans or support from him, he was once again approached in desperation by the doctors for some guidance as to the way forward. He could not be reached because he had joined Premier Magashule on a trip to Cuba that included an entourage of 72 people at a cost of at least R14 million. The HOD, Dr David Motau, was in Germany and could also not be reached. No one in top management was available to take care of the crisis. According to the department's spokesperson Mvambi the purpose of Premier Magashule’s visit to Cuba was to recruit scarce skilled professionals like engineers and doctors for the Free State in order to bring about a radical improvement in the province. Yet since the beginning 2014, nine applicants for medical officer posts in Dihlabeng Hospital went unappointed either due to lack of funding or because the HOD didn't find time to sign the applications. On 28 November, Dr Mzwanga sat in the office of the acting CEO of Dihlabeng Hospital vowing to do his best to find doctors for the hospital as a matter of urgency. Recently a handful of applications by doctors and other medical staff were returned to Dihlabeng from head office, all unsigned. Among those were two applications from doctors which sat on Dr Mzwanga’s desk, untouched, since October 2014. These doctors found employment elsewhere. Doctors have attempted to discuss the problems with MEC Molokoane to try to find a way forward. They have made various attempts to meet with him, only to be shrugged off. He accuses these doctors of exaggerating. He refers to these concerned doctors as ‘complaining pimps’. Many doctors have left. The remaining doctors have to work much harder, sometimes up to 160 hours per week, in order to deliver quality of care in accordance with the Batho Pele Principles. At Dihlabeng Hospital a total of four medical officers will remain in March, down from 20 in 2012. At the moment only emergency procedures are performed and numerous patients awaiting surgery are turned away. Many hospitals teeter on the brink of collapse, barely managing on minimal doctors and nursing staff. This is the position that the majority of Free State hospitals are in. Most doctors and nurses try their best to keep Free State hospitals afloat under these tough circumstances, but they receive no support from the Department of Health. Instead they are blamed for most problems. Patients should be aware of this when they receive poor service in a hospital. Granted, some doctors and nurses are at fault, but the root of the problem lies at provincial and national level. Read the response to this article by the Free State government. Copyright © GroundUp, 2012-2015. This article is available under a Creative Commons Attribution-NoDerivs 3.0 Unported License.